There are 2 different ways to construct the frame, depending upon your machine/table set up. Both are described here. 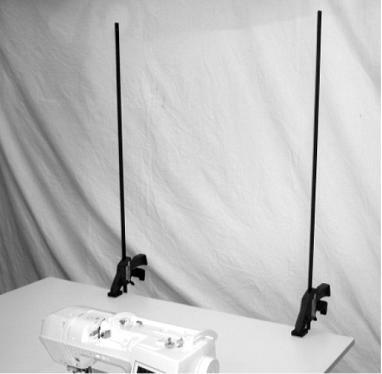 Side Mount: If your table/cabinet is less than 6’ wide and more than 1½’ deep you’ll want to place the clamps on the sides. 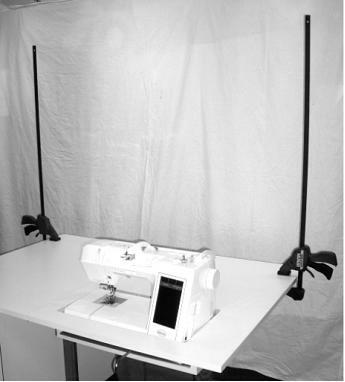 To do this clamp the Slide Clamps to the table/cabinet on each side about 1½’ behind the sewing machine. Attach the aluminum slat to the holes in the clamps with bolts and wing nuts. 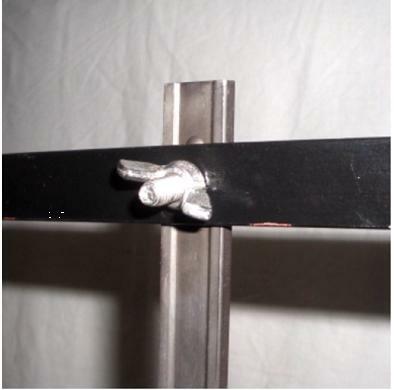 Back Mount: If your table/cabinet is more than 60” wide and less than 2 feet deep, you’ll want to place the clamps along the back. To do this clamp the Slide Clamps to the table/cabinet along the back – about 3 1/2’ apart. Then slide the metal rod through the holes in the clamps (this is shown 2 pictures down). 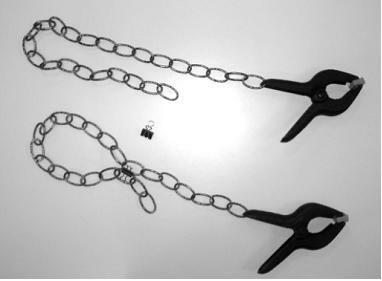 Attach one chain to each Spring Clamp by opening an end link, inserting it through the hole in the clamp and closing the link. 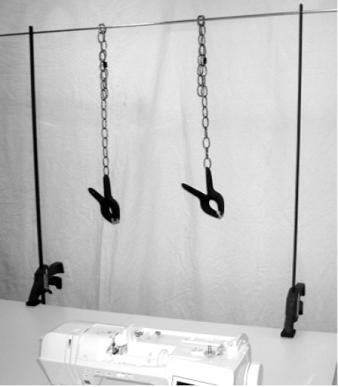 Place the end of one chain over the top bar and Bull Nose clip the chain to itself so the Spring Clamp is at a good height (this can be easily adjusted depending on the size of the project). Repeat for the other chain/clamp. Place the quilt under the sewing machine needle in the area you want to begin quilting. Be sure that you have the bulk of the quilt behind the machine. Grab a bunch of the quilt even with the right side of the machine and about 3’ back on the quilt, raise it up and grab it with the right clamp. Repeat behind the left side of the machine with the left clamp and you’re ready to begin quilting. As you progress across your quilt simply unclamp and reclamp as seems necessary. I hope many of you will find this helpful and will let me know how it works for you. 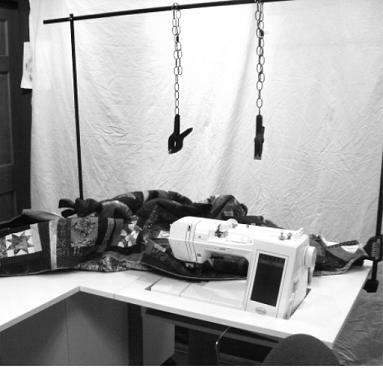 Please feel free to share this information and/or forward my blog to your quilting friends! This is fabulous. Such a great post and thank you for sharing. I know everyone will benefit from your ideas and especially their backs. I plan on duplicating this in my room. I look forward to trying this when I am ready to start my free motion quilting. This is a wonderful solution. Thank you. I finished my compass and I must say your method made it happen. Thank you so much. Also I have arranged my sewing area as you showed in the L shape tables and will soon be ready to start quilting my little compass quilt. I will send a picture when it is done, shall I send it to your email. I am a beginner with free motion quilting and with quilting in general but I am going for it anyway. I have been practicing and hope that will pay off when I start quilting on my little mariner compass quilt. Any helpful tips from anyone would be appreciated. i used my float for the first time this past winter and OMG! what a complete difference with free motion quilting. LOVE IT!